The Petsafe Free to Roam Wireless Containment Fence is perfect for anyone who wants to keep their dog safe without digging up their entire yard. Its portable, wireless, and can be set up within 2 hours or less. 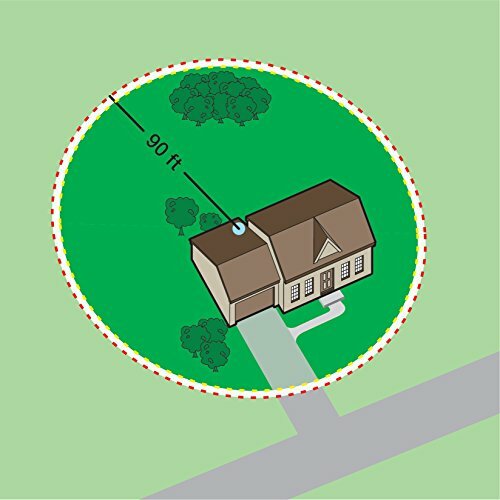 The system allows you to set up a wireless circular boundary that is up to a half acre in size. This gives your dog plenty of room to roam around and have a good time. The boundary is adjustable and can easily go from 5 to 90 feet in all directions. While the boundary zone can be adjusted, the shape of the boundary can’t be changed. It will always be a circle. This can prove to be a problem since most yards are not in the shape of a circle. Anytime your dog gets too close to the boundary the transmitter will emit an audible beep. The beep is a warning to let your dog know he or she is getting too close to the boundary. If your dog continues on without stopping that is when a mild stimulation will be sent through the collar. The correction, which is completely harmless, is meant to get your dogs attention and let them know they are somewhere they shouldn’t be. The system features 5 levels of static stimulation which means you can customize it to fit your dog’s temperament. Little dogs of course shouldn’t get the same level of stimulation as bigger dogs. There is also a tone only mode if you would prefer no stimulation. 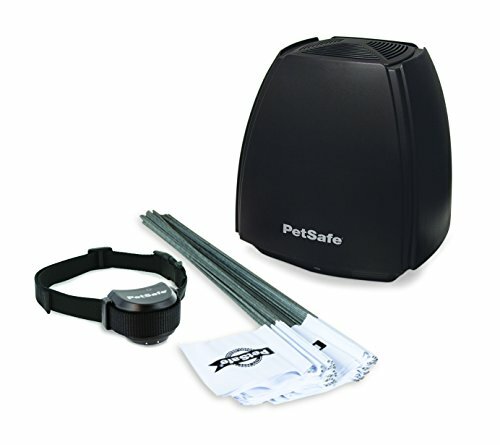 The Petsafe Free to Roam Wireless Containment Fence is portable and perfect for those who love to go on road trips. Please note things such as terrain and metal objects can affect the range of the signal. 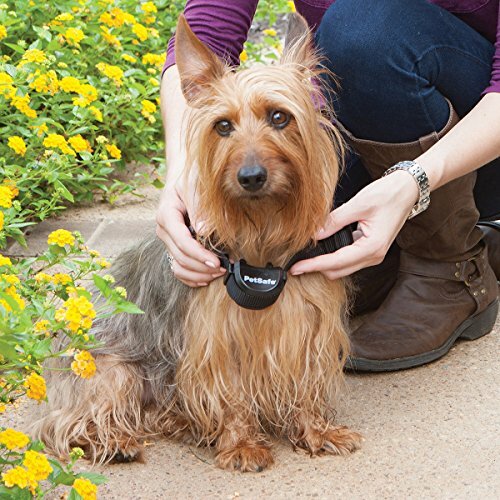 The receiver collar is waterproof, lightweight, and ergonomically designed. The nylon strap is extremely comfortable and easily adjustable. The receiver collar is ideal for dogs over 5 pounds and can fit neck sizes between 6-28 inches. The collar comes with easy to install batteries that last up to 2 months. The transmitter is nicely designed and can be placed almost anywhere in your home. It can also handle an unlimited number of pets as long as you purchase additional receivers. If you want to expand the play area for your pets you can have up to 3 Petsafe wireless transmitters set up at the same time. The kit comes with 50 boundary flags that can be used for training. Each flag should be placed along the boundary line with 5 steps between each one. If additional training flags are needed they can be purchased separately. The system is portable and can easily be taken with you on vacation. Easy to set up. Can have everything up and running in less than 2 hours. Completely wireless. All you need is an AC socket. Provides coverage for up to half an acre. The collar is adjustable and waterproof. Wireless boundary. No wires to install. Expandable boundary. Can easily be expanded by purchasing additional transmitters. Manufacturer’s warranty included. However, it is only valid if you purchase the system from an authorized retailer. Receiver collar is not rechargeable. You will therefore need to purchase batteries every couple of months. The circular boundary cannot be adjusted. For example, if you want to change the shape to a square that would not be possible. Some users have complained about the quality of the collar. One user said it broke in just 6 months. The signal can be inconsistent if you live in an area with trees. Price seems to be an issue for many users. The unit costs close to $300.